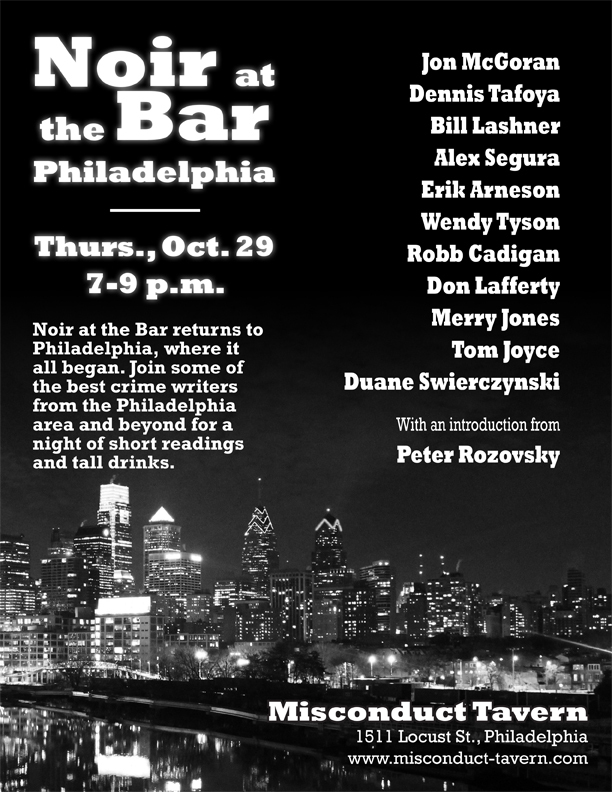 Noir at the Bar returns to Philadelphia later this month! 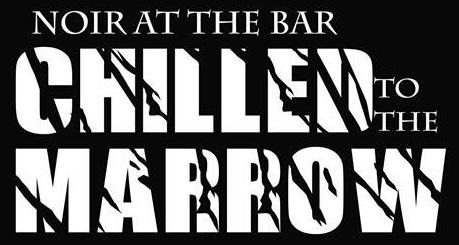 We’ll be at the Misconduct Tavern, 1511 Locust St., on Thursday, Oct. 29, from 7 to 9 p.m. Eleven authors will read their work, with the granddaddy of N@B — Peter Rozovsky — introducing the whole thing. I’m stoked to be a part of it. Robb Cadigan, Merry Jones, Tom Joyce, Don Lafferty, William Lashner, Jon McGoran, Alex Segura, Duane Swierczynski, Dennis Tafoya, and Wendy Tyson. Episode 19 of the Title 18: Word Crimes Podcast is out! This episode of Word Crimes was recorded live at Misconduct Tavern in Philadelphia, Pennsylvania, at a terrific Noir at the Bar event. It features readings by Merry Jones, Don Lafferty, Sarah Weinman, and Dennis Tafoya. Hosted by Peter Rozovsky, Noir at the Bar kicked off the great NoirCon, which takes place every two years in Philadelphia. All told, a dozen authors read their work in front of an enthusiastic, standing-room-only audience. This episode is part two of three. Part one can be found here, and part three will be available on Dec. 18. Did you enjoy this episode of the Word Crimes podcast? Let us know by posting a comment here, on Twitter or Facebook — or, best of all, rate the podcast on iTunes or Stitcher. Thanks! 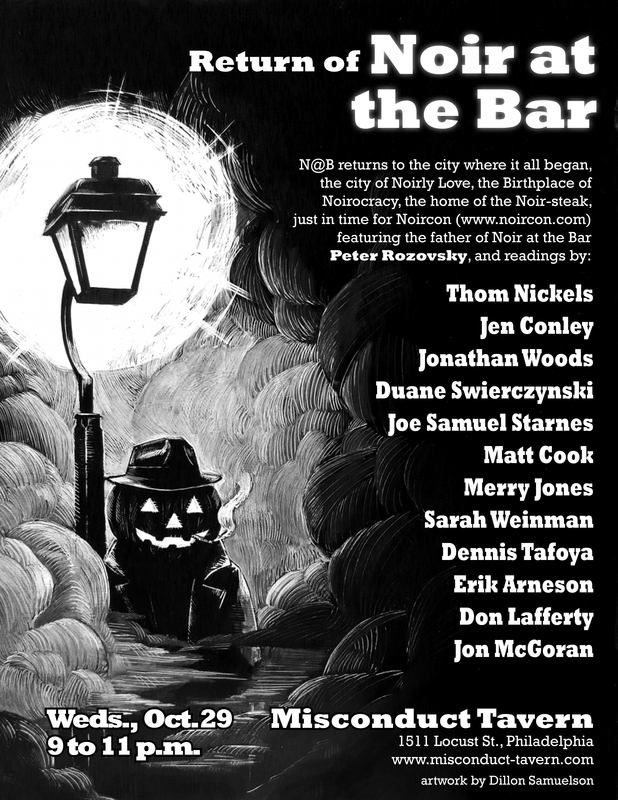 Noir at the Bar returns to Philadelphia on October 29, 2014 — just in time for NoirCon 2014 (and Halloween)! Come hear Thom Nickels, Jen Conley, Jonathan Woods, Duane Swierczynski, Joe Samuel Starnes, Matt Cook, Merry Jones, Sarah Weinman, Dennis Tafoya, Don Lafferty, Jon McGoran — and me! — read some crime fiction at Misconduct Tavern. The fun starts at 9 p.m. I hope to see you on October 29 at Misconduct Tavern in Philly!